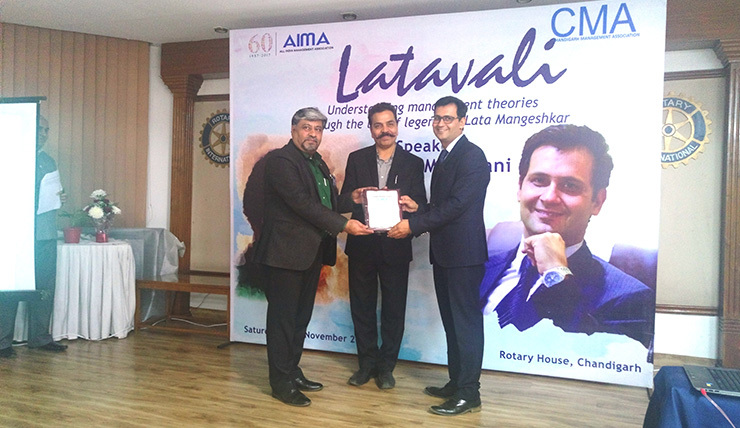 CMA had organized a talk on Latavali – a one of its kind management theory crafted by Mr. Sandeep Menghani an accomplished management professional from Yeshasvi Bhav, Jaipur, on November 18, 2017 at the Rotary House, Chandigarh. Mr. Sarvapriya Nirmohi, senior broadcaster from All India Radio was the chief guest and the event was attended by 50 CMA members. Mr Menghani intertwined the management theories and rise of a talent to a legend with accurate description and in an eloquent way. The concepts of shortening the unknown dark window of Johari, professionalism, product, communication skills, customer delight, packaging, networking and leadership skills to ultimately talking about the entrepreneurship of Lata, the legend. The management theories were aptly deliberated by him in a melodious and informative talk that narrated creation of Lata Ji as a brand over seven decades – a towering persona created out of sheer dedication, integrity, sincerity and talent. The audiences correlated through the quotes, incidences and events of the journey of this marvellous world of Lata Mangeshkar. The session was followed by question & answers with members engaging in insightful interactions making the event a grand success.